Dry roast the grated coconut and sugar in a frying pan for 2 minutes. Transfer it to a bowl along with chopped cashews, bread pieces, Kerala banana ( poovan pazham), and a pinch salt. Press tightly all these ingredients with your hand and make a smooth dough by adding milk. 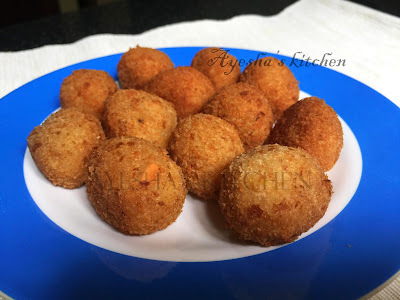 Now make small balls ( lemon sized) and roll it in breadcrumbs and then deep fry in hot oil. When the color of the balls changes to golden ( do not over fry), remove from the flame. Serve hot with a nice cup of tea !!!! !